The next Bose aviation headset to earn its stripes. A new forward thinking Aviation headset designed specifically for airline and corporate aircraft flight decks. Only the new Bose ProFlight Aviation Headset features advanced Bose technology in an innovative new form factor, with features designed for lower noise environments and the unique needs of pilots who fly in airline flight decks and corporate jet aircraft It is our smallest, lightest active noise cancelling communication headset ever. Pilots will now experience the clarity they expect, along with user-configurable performance that is designed for comfort over extended flights. Three user-selectable levels of active noise cancellation, a quick-release, side-swappable down cable and mic, Bose Acoustic Noise Cancelling technology and full function Bluetooth® connectivity. 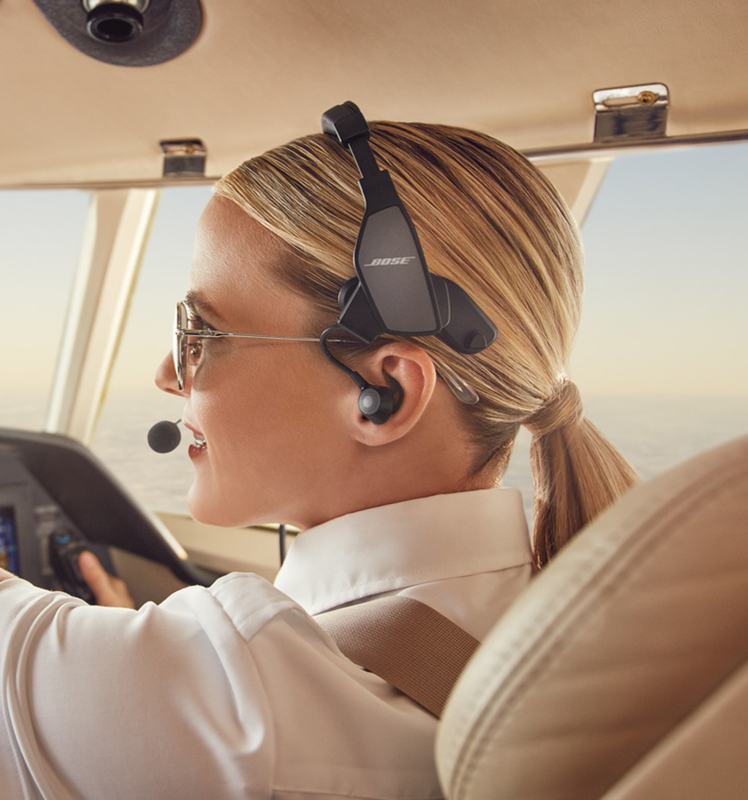 The ProFlight headset features tap-control for talk-through communication, allowing pilots to better communicate with those outside the intercom. ProFlight's form factor is unlike any other headset – a highly stable, headbanded in-ear configuration without the usual intrusive deep-insert eartips. The Bose ProFlight Aviation Headset, like the award winning A20 Aviation Headset, is FAA and EASA E/TSO-C139a certified. Now there's a Bose headset that is right for you, whether you fly in a cockpit or on a flight deck. Introducing the industry's smallest, quietest, and most comfortable active noise cancelling communication headset. We took 30 years of Bose research and innovation, incorporated more than 30 US design and utility patents, added new features ... and fit it all into just 139 grams (4.9 ounces) on your head. 1. Long term comfort over extended flights. Our smallest, lightest, most comfortable headset yet – thanks to our unique new form factor. 2. 139 grams (4.9 ounces) on-head weight. Helps enhance comfort over long periods of use. 3. Electret noise cancelling mic. Increases clarity and reduces background noise when transmitting, specifically for aircraft with “hot mic” or PTT systems. 5. Digital active noise cancellation. Significantly reduces ambient noise, allowing users to lower radio volume and hear what they need to hear. 6. Three user selectable levels of noise cancellation. Allows for user preference and aircraft noise environment. 7. Tap control for talk-through communication. 8. Bluetooth® connectivity and audio prioritization. Provides primary intercom audio with or without power to the headset. 10. FAA TSO & E/TSO-C139a certified. ProFlight is available in a twin plug, 5 pin XLR, 7 pin XLR or 6 pin LEMO plug configuration. Powers down automatically when not in use. Auto-on feature available on select configurations. 13. Quick release side-swappable mic and down cable. Mount the boom mic and down cable on either side of the headset. No tool required. Two AA batteries power 45+ hours of use without Bluetooth and at least 25 hours with Bluetooth on. Aircraft powered variants are also available. Silicone material provides a more comfortable fit. Three sizes included. Easily removed and replaced without tools. Ergonomic design, provides control of headset's primary functions, including three levels of active noise cancellation, Bluetooth functions and priority switching. Included lanyard provides easy stowage during flight. An enhanced way to enable Bluetooth audio sharing, manage connections, pair and unpair, rename devices. Updateable and scalable with continuously developed features. Worldwide coverage. Excludes normal wear parts such as the eartips, mic cover and headband.